The two Granular Synthesis devices for Ableton Live (Instrument and Fx), implements respectively a sound file granulator (wav,aiff or mp3) and live-buffer granulator. The first must be loaded this on Ableton Live MIDI track, the second can be loaded either on audio or MIDI tracks like a normal Ableton Live device Fx. 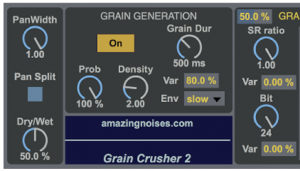 Granular Synthesis plugins for Ableton Live. DensityM4L Instrument and DensityM4L FX, implements respectively a polyphonic sound file granulator (wav, aiff or mp3) and a polyphonic live-buffer granulator. 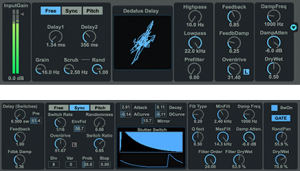 DensityM4L is a new real-time software designed especially for LIVE asynchronous granular synthesis and sound file granulation, a genuine granular playground able to generate a wide range of usual and not so usual effects: time/pitch shifting, time/pitch jittering, intricate textures, grain fountain/pulverizer, recording and manipulation of buffers, complex scrub pad exploration, dynamic envelope shape drawing and many more. Besides the basic tools, even more advanced tools are available to control the grains! You have smooth transitions (interpolation) between global presets (snapshots), you can navigate with hyperVectorial pads or/and sequence your snaps using the “snap rhythm improviser” which provides an unique & powerful way to generate incredible sound phrases. All is packed in an optimized visually sharp interface, easy to use and access when fast improvising live or lazy composing in a studio. Density.m4l requires a Mac PPC or Intel machine running OS X 10.4 or later, and 1 GB RAM. Density.m4l requires a Windows XP/Vista/7 machine and 1 GB RAM. Density.m4l requires Live 8.2.2 and Max For Live. Details about Max For Live can be found at Ableton.com. 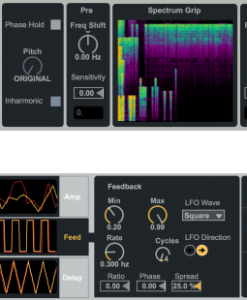 This bundle will only work in Ableton Live (not in the MaxMSP application). Max for Live puts the power and potential of Max/MSP inside Live. Create all the instruments, effects and extensions you’ve ever wanted. Go beyond the common and predictable, and transcend the limits that conventional tools impose. Build completely unique synths and effects, create algorithmic composition tools, or fuse Live and controller hardware into radical, new music machines. Join a society of makers and share ingenuity. 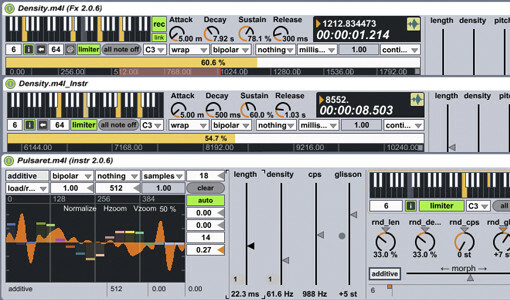 Max for Live was co-developed by Ableton Live and Cycling ’74. Density.m4l uses QuickTime in order to read correctly media files (including MP3), therefore QuickTime must be installed on your system. On Windows we recommend a complete installation of QuickTime choosing all optional components. Pulsaret.m4l is a new interactive real-time tool for asynchronous/synchronous prototypes granular synthesis. transitions and Hyper Vectorial pads they simplify the creation of incredible sound objects. Matrix & LFO provide a powerful way to connect one parameter with a dependent parameter/s, implementing all grainlets kind. IMPORTANT: PulsaretM4L requires Live 8.1 (better 8.2.2 or higher) and Max For Live. Details about Max For Live can be found at Ableton.com. 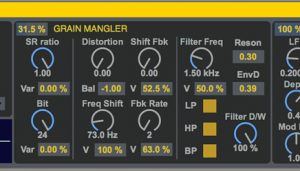 DensityM4L plugins will only work in Ableton (not in the MaxMSP application). Density.m4l and Pulsaret.m4l require a Mac PPC or Intel machine running OS X 10.4 or later, and 1 GB RAM. Density.m4l and Pulsaret.m4l require a Windows XP/Vista/7 machine and 1 GB RAM. Density.m4l and Pulsaret.m4l require Live 9 and Max For Live. Details about Max For Live can be found at Ableton.com. 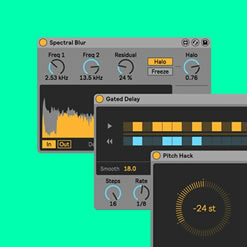 This bundle will only work in Ableton Live (not in the MaxMSP application). Density.m4l and Pulsaret.m4l use QuickTime in order to read correctly media files (including MP3), therefore QuickTime must be installed on your system. On Windows we recommend a complete installation of QuickTime choosing all optional components.